This pretty girl is Azalea. 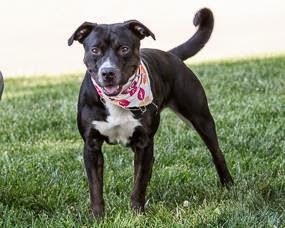 She a Terrier, American Staffordshire, Hound mixed breed dog at Wayside Waifs animal shelter in Kansas City, MO. Azalea is only 22 months old and quite a beauty. She found herself at Wayside Waifs after being picked up as a stray. She must have had some very hard times on the street, because when she first arrived at the shelter she was very afraid of people. She's come a long way in building her confidence and learning to trust again. Hello there! 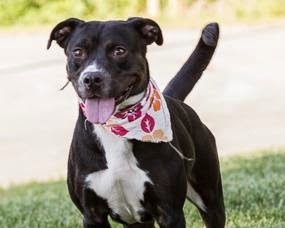 My name is Azalea and I am a beautiful 1 and a half year old American Staffordshire Terrier/Hound. I came in to Wayside as a stray when animal control found me wandering the streets. It was hard not having a home to call my own at such a young age. I'm so thankful I ended up at Wayside. I have made so many good friends and for the first time in a long time, I finally feel safe. Everyone tells me this is the place where I will find my new family. I want to tell you a little about myself in the hopes that you might be the family for me! When I first got to Wayside Waifs I was so scared. I didn't understand that people could be so kind and loving. The staff felt it was best for me to start working with a team of volunteers who work with shy and fearful dogs like me. I'm so glad I did, because I am like a different dog today! I wanted to so badly to be loved and for someone to notice what a good girl I was. I can't believe it, but they did! They worked with me slowly on how to trust again, and gave me an avenue where I could build up my confidence. One of my friends here started working with me on agility. I love learning how to do the course and she says I've gotten so good at it! She says that I complete everything in the agility course in the order I'm supposed to and how quickly I've picked up on things! It feels so good to hear such positive things about myself. It's a new feeling but a girl could definitely get used to it! The staff thinks it is best if I go to a home with kids over 5 years old. Since it can still take me awhile to warm up, I think it's best for now. Even though I've come such a long way, it will be important to go slow with me when we first meet. Once I get to know you, I will show you my sweet and playful side! I love to cuddle and be close to you, it's how I show you the love I have for you. I really want to go home with someone who will help me get daily mental and physical stimulation. Going for walks and playing will help me to become a well-rounded dog! Since I'm still a young girl, I will most likely need work on housetraining and basic obedience. I want more than anything to make you happy so with positive reinforcement training and patience, I should learn quickly! What I need most is someone who will take a chance on me and show me how wonderful life really is. I've been through more in my short life than I care to admit, but it doesn't stop me from trying to live to the fullest! If you are looking for a sweet and loyal companion, look no further! 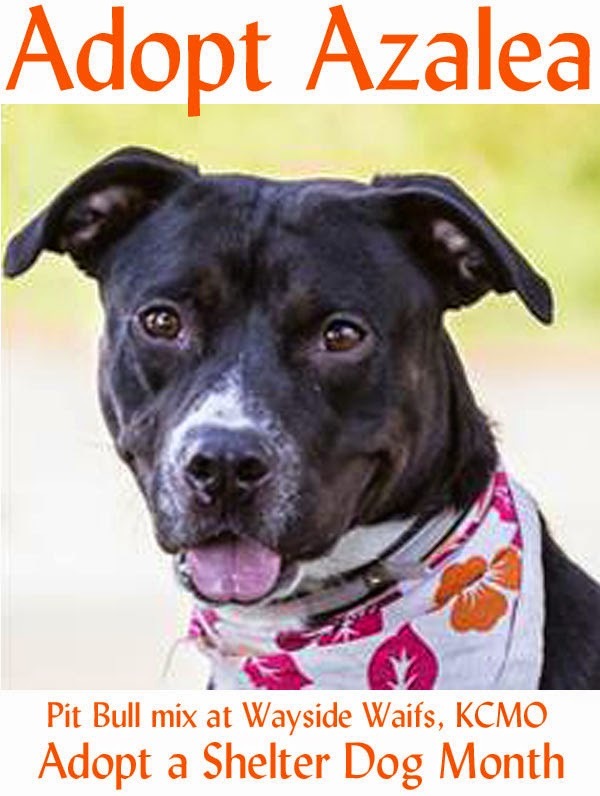 Come on out to Wayside Waifs and ask to meet Azalea. My bags are packed and I am ready to walk away from the shelter and into our new lives together, as a family. 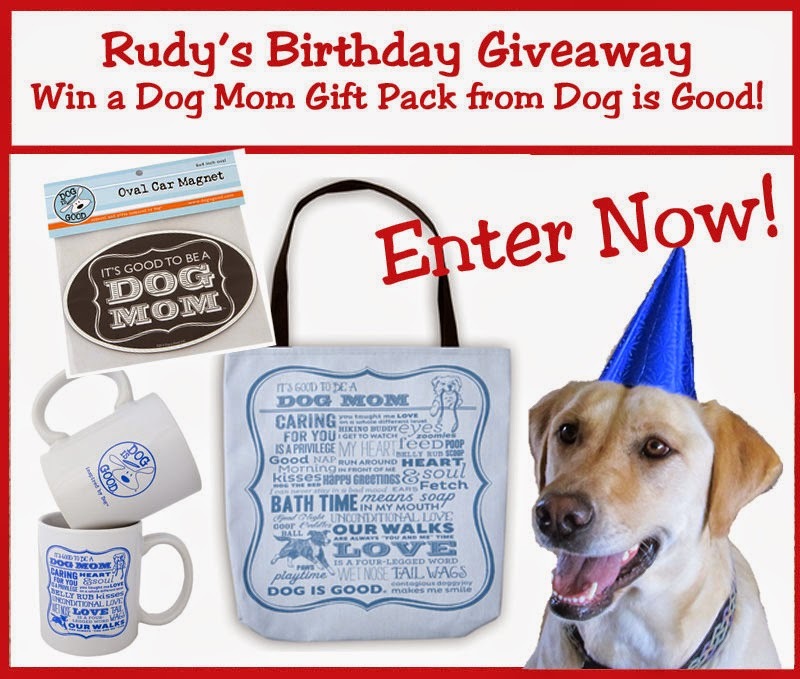 Don't miss Rudy's Birthday Giveaway! Enter now! She looks like such a fun loving and energetic girl. And so sweet! She's going to make someone a great new family member, hopefully soon. What a beautiful girl. Hope she gets a home soon. Shes gorgeous, and it's so amazing that they're able to work with her on agility, it's such a great confidence booster for fearful dogs. Hoping she finds a great forever home soon. Azalea sounds like she training to be the best dog ever. Sharing.